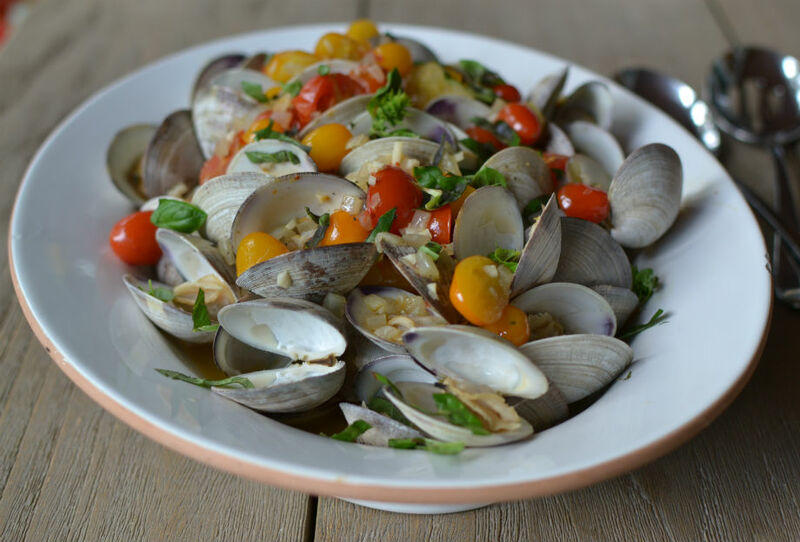 If I had to choose my all time favorite type of seafood, it would undoubtedly be clams. However the kids haven’t jumped on the clam bandwagon, yet. They will eat seared ahi tuna, calamari even octopus. And the Hub says he likes them but will eat just a few. So when you buy a 50 count bag that leaves quite a few for me. Yippee. Last night I made them with a garlicky white wine sauce, ripe cherry tomatoes and basil picked from my garden just minutes before. Add to that a big hunk of warm baguette and a crisp white wine. Sort through clams and discard any with cracked or broken shells. Place in large bowl or pot and cover with fresh water by 4 inches. Sprinkle some cornmeal over water, now let sit covered for 1-3 hours. Gently remove clams from water and rinse under running water, scrubbing away any dirt and debris. To cook place on BBQ on med-high heat, close cover and check periodically for those that have opened and add them to serving bowl. Or steam in large pot over boiling water, checking periodically and adding to serving bowl as they do. In the meantime in large skillet cook onion, seasoned with a bit of salt, over medium heat until translucent, approx. 3-5 mins. Add garlic and cook 30 seconds or so while stirring. Raise heat to high and add wine, boil 2-3 minutes. Reduce heat to medium and add stock, cherry tomatoes and hot pepper flakes if using. Simmer for 4-5 minutes until tomatoes are warmed through but still holding their shape. Turn off heat add lemon zest and basil, pour over clams in serving bowl.